VitalBodies new computer that can handle graphics for creating 3d art has finally arrived! Eco packaging, solid construction and a real key and lock – Plus wow, this workstation is big! THINKSTATION: This computer can support 2 Xeon 5400 series quad processors for a fast 8-core system. Plus you can add up to 32GB of Fully buffered ram and two graphics cards! You can put 5 hard drives below and there are three 5.25 inch drive bays in the front. Add one 3.5 inch floppy sized bay and you have a fully loaded system. 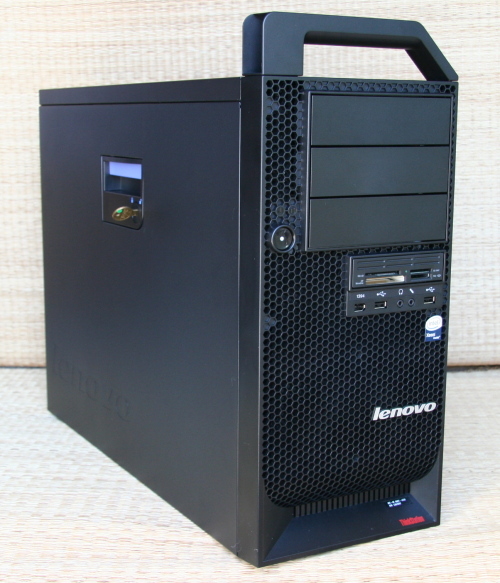 The case is a 7U rack mountable design that can also be used as a tower. Two 250GB drives as a raid and will run Ubuntu 64-bit Hardy Heron. The data will live on its own front loaded hot swappable removable SATA drive. There will also be a media card reader in the front. ECO FEATURES: Of course! EnergyStar 4.0 compliant, recycled materials and High efficiency power supply. QUIET: Another big plus for anyone using this workstation is how silent this computer is.